Organic Top Shelf® Compost is transformed through blending nitrogen and carbon material at a sustained high temperature with the right amount of oxygen and moisture. Millions of microbes then go to work breaking down the organic matter into humus-rich food for your soil. This bag contains Medina® Growing Green Fertilizer and should be generously applied to your garden or flower beds before planting for maximum benefit. The Organic Top Shelf® Compost in this bag has met the STA requirements as set forth by the US Composting Council®. 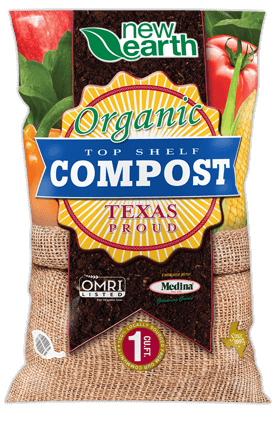 This bag of Organic Top Shelf® Compost is OMRI® listed. Organic Top Shelf® Garden Soil is crafted from locally sourced raw materials to ensure quality performance in your landscape. We start by taking our Organic Top Shelf® Compost, add a clean chocolate loam, and Poteet red sand to allow for a proper balance of moisture holding capacity and tilth. This bag contains Medina® Growing Green Fertilizer to help jump-start your garden or landscape. This specialty blend is perfect for your garden or any general landscape application. The Organic Top Shelf® Compost in this mix has met the requirements set forth by the US Composting Council®. 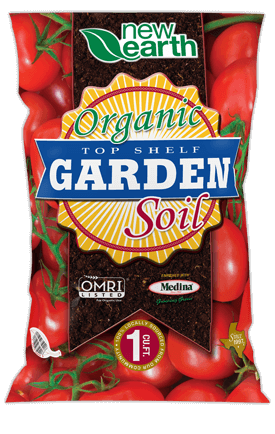 This bag of Organic Top Shelf® Garden Soil is OMRI® listed. Organic Top Shelf® Potting Soil is created from organic materials close to home ensuring great performance in your landscape. We start by taking our Organic Top Shelf® Compost then add sand, pine bark, perlite and a starter charge of Medina® Growing Green Fertilizer. This mix forms an ideal media for your plants to grow strong in container pots, raised beds, or your garden. The Organic Top Shelf® Compost in this mix has met the STA requirements as set forth by the US Composting Council®. 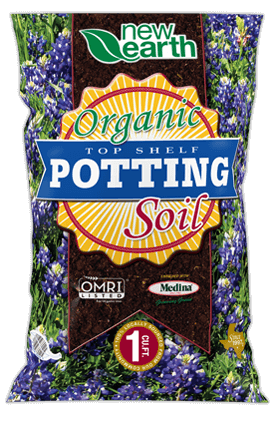 This bag of Organic Top Shelf Potting Soil is OMRI® listed. Premium Composted Mulch is one of our darkest and most aged mulches. It is a natural product that provides weed suppression, moisture retention, and color enhancement. Premium Composted Mulch works great to add organic matter, beneficial microbes, and nutrients into your mulched areas. 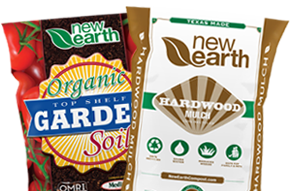 New Earth’s mulches are made from 100% recycled wood sourced from your community. These products are processed to provide the most beneficial and appealing material available and packaged for your convenience. Follow the directions below for the best results. Thank you for choosing New Earth Premium Composted Mulch to beautify your landscape! 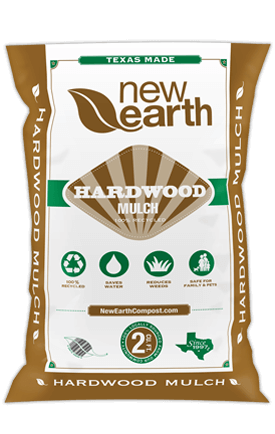 New Earth Hardwood Mulch is made from 100% recycled products from right here in our community. Hardwood Mulch is a natural product that provides weed suppression, moisture retention, and color enhancement. This product was created to provide you with the most beneficial and appealing product available and packaged for your convenience. Follow the directions below for the best results. Thank you for choosing New Earth Hardwood Mulch to beautify your landscape! 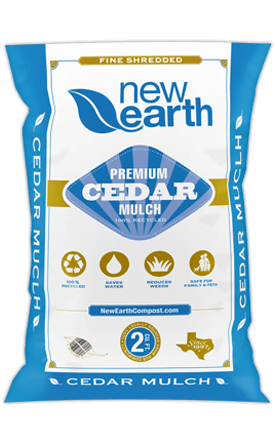 New Earth Premium Cedar Mulch is made from 100% recycled products from right here in our community. Premium Cedar Mulch is a natural product that provides weed suppression, moisture retention, and color enhancement. This product was created to provide you with the most beneficial and appealing product available and packaged for your convenience. Follow the directions below for the best results. Thank you for choosing New Earth Premium Cedar Mulch to beautify your landscape! 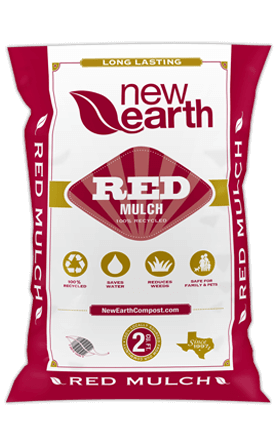 New Earth Red Mulch is made from 100% recycled products from right here in our community. Red Mulch is a natural product that provides weed suppression, moisture retention, and color enhancement. This product was created to provide you with the most beneficial and appealing product available and packaged for your convenience. Follow the directions below for the best results. Thank you for choosing New Earth Red Mulch to beautify your landscape! 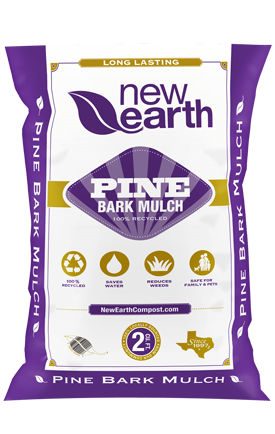 New Earth Pine Bark Mulch is made from 100% recycled products from right here in our community. Pine Bark Mulch is a natural product that provides weed suppression, moisture retention, and color enhancement. This product was created to provide you with the most beneficial and appealing product available and packaged for your convenience. Follow the directions below for the best results. Thank you for choosing New Earth Pine Bark Mulch to beautify your landscape! New Earth Soil Conditioner is finely screened and crafted from our premium aged pine bark and a compost blend. It is designed to enhancesoil such as water retention, permeability, water infiltration, and aeration. It can also be mixed with sandy soil to improve structure, compacted soil to improve drainage, or mixed with regular soil to maintain sustainability for plant growth. Soil Conditioner is ideally suited for planting annual color crops, amending compacted beds, or can be used as a finely ground premium aged mulch for topdressing. Thank you for choosing New Earth Soil Conditioner to beautify your landscape! New Earth Landscaper’s Mix is made from 100% recycled products from right here in our community. Landscapers Mix is a natural product that provides weed suppression, moisture retention, and color enhancement. This product was created to provide you with the most beneficial and appealing product available and packaged for your convenience. Follow the directions below for the best results. Thank you for choosing New Earth Landscaper’s Mix to beautify your landscape! 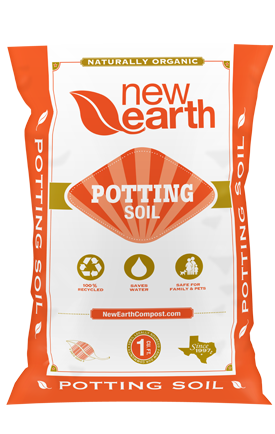 New Earth Potting Soil is a general purpose growing media for indoor and outdoor potted plants, container planting and raised beds. New Earth Potting Soil can be incorporated into existing gardens or used as a stand-alone potting soil. Thank you for choosing New Earth’s Potting Soil to beautify your landscape! “I have been using New Earth for over 4 years now. Not only are their products the best on the market and competitively priced, their customer service is unmatched. High-quality products delivered to the job site when they say they will be there.